Get rid of unwanted hair in Ashland, KY with the “Gold Standard” in laser hair removal. Laser Hair removal permanently reduces unwanted hair. Laser Hair removal can be performed on almost any area of the body for men and women, from small areas such as your upper lip, underarms, bikini area, chin, neck, and face, to larger areas such as arms, chest, back, and legs. The Laser Hair Removal works by sending a beam of laser light and radio frequencies to the hair follicles with enough power to disable or destroy the root, but not enough power to harm the skin or cause discomfort. Depending upon the area treated and hair growth, at least five treatments are recommended for ultimate results. Ageless Aesthetics MediSpa has specialized lasers that are effective on a variety of skin tones and hair colors. What Happens Before Laser Hair Removal Treatment? Patient may not pluck, wax, use a depilatory or undergo electrolysis in the areas they wish to have treated for 6 weeks prior to laser hair removal. The patient should only shave or trim the area before treatment. Patient should not tan the areas to be treated for 4 weeks prior to treatment or use self-tanning products for 2 weeks prior to treatment. What Happens Post Laser Hair Removal Treatment? Some redness and swelling may occur in the treated area after treatment. However, this should resolve within several hours to several days after treatment. Tanning should also be avoided for at least one month after treatment. IPL Skin Rejuvenation Laser will safely and comfortably fade the appearance of skin imperfections caused by the sun, and uneven skin tones cause by brown spots, acne, veins, and age spots. How Does the IPL Fotofacial Laser Work? The IPL laser uses a mixture of many wavelengths of light and bi-polar radio frequencies that work beneath the skin&apos;s surface to reduce brown spots, discoloration, redness, and broken capillaries. The IPL works as an agent to help pull the age spots to the top layers of the skin. Within 3-5 treatments, the area treated can be significantly lightened or removed. The IPL has the ability to help minimize fine lines and discolorations, while improving the overall skin texture with no down time. This treatment is effective for almost all skin types. Gradual and cumulative improvement of the skin tone is typically achieved in five treatment sessions. The total number of required treatment sessions depends on your skin&apos;s condition. Cooling of the skin surface ensures additional safety during treatment. There is no downtime and many patients return to normal activities immediately after treatment. This Skin Tightening and Refirming Laser is one of the newest FDA-approved non-invasive, non-surgical procedure used for restoring a youthful appearance. It uses a unique combination of two of today&apos;s best modalities, bipolar radiofrequency and infrared light, to produce outstanding skin tightening with little discomfort and no downtime, leaving your skin free from potentially harmful side effects. The Skin Tightening & Refirming Laser is a complete anti-aging solution for targeting signs of aging, including, jaw and neck laxity, sagginess under the eyes, saggy brow lines, and nasolabial folds. The Skin Tightening & Refirming Laser utilizes both infrared light energy and bi-polar radio frequency energy to heat dermal tissue. This heat helps activate the body&apos;s natural collagen production, helping in the process of removing wrinkles while also helping to firm loose or sagging skin. With this laser, fine lines and wrinkles are reduced, a noticeable lifting of the skin occurs, and the texture of the patient&apos;s skin becomes smoother, with a more luminous tone. Ageless Aesthetics recommends 3-5 treatments for maximum results. Most patients see gradual and cumulative results throughout the laser treatments. The total number of required treatment sessions depends on your skin&apos;s condition. This laser is a safe and effective solution for all skin types. The Skin Tightening & Refirming Laser is a gentle, comfortable treatment, requiring no downtime. Many patients return to normal activities immediately after the treatment. The cooling of the skin&apos;s surface provides enhanced safety and additional comfort. We are now offering the latest technology in Tattoo Removal. 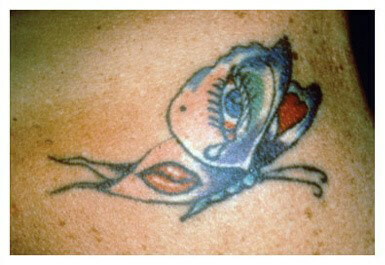 This laser is safer than the traditional methods because of its unique ability to selectively treat the tattoo. It will eliminate the tattoo while leaving the surrounding skin undamaged. We can treat all tattoos, amateur or professionally done. We can remove ALL colors of pigment. The effectiveness of the laser is dependent upon the age, location, depth, composition of the pigments and type of tattoo. The only Tattoo Removal Laser in the TriState Area Ashland, KY; Portsmouth, OH; Huntington, WV. This is a Q-Switch laser. This laser goes directly into the pigment and breaks the pigment up. Over the next 4-6 weeks the body will absorb these particles and dispense them. All areas are treatable except eye lids and lips. All tattoos will take a series of treatments. You can expect desired results between 8-12 treatments. These treatments can be performed every 6 weeks as needed. Is the Tattoo Laser Right for Me? It depends on your skin color. We cannot use this laser on dark skin or freshly tanned skin. You will be asked to stay out of the sun and tanning bed for 2 weeks prior to your procedures. If you are on photo-sensitive drugs you need to be off these medications for 7-10 days. If you have been on Accutane, we ask that you wait 6 months before you begin your procedures. Treatments vary from patient to patient, depending on many factors of the tattoo. All patients will be asked to wear eye protection. 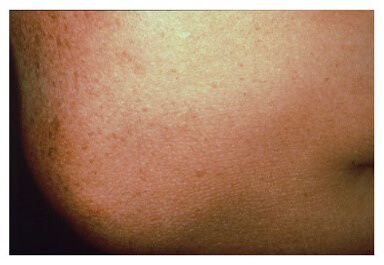 The skins reaction to the laser is tested during the first visit to determine the most effective treatment. Treatment consists of placing the hand piece against the surface of the skin and activating the laser. Many patients describe it feels like a rubber band snapping against the skin. ALL tattoos will require retreatments, necessitating multiple patient visits. This laser is less painful and requires less recovery time then many others. The degree of discomfort varies with each person. Most patients DO NOT require pain management. In some cases, depending on the location and pain tolerance, we may elect to use some form of anesthetic. Recovery is easy. You basically care for the removal the same way you did when you received the tattoo. Cleanse gently with anti-bacterial soap for 2-3 days. You need to apply antibacterial ointment or A&D ointment to the treated area for 2-3 days. The use of a gauze bandage may be beneficial for the first day or so. No physical exercise, aerobics, lawn work, contact sports for 24 hours. And last but definitely not least, NO SUN or TANNING the area for 30 days. The Fractional Resurfacing Laser enhances the overall texture irregularities and improves mild to moderate wrinkles. This laser also targets skin discolorations, such as redness, brown spots, or scarring. How Does the Skin Resurfacing Laser Treatment Work? Radio Frequency energy is precisely directed to tiny matrix spots. The healthy skin around the spots accelerates the healing process of the skin. After the treatment, the patient may notice increased levels of beneficial collagen and new healthy skin cells being produced. Mild to moderate wrinkles and superficial skin discolorations are reduced, and the texture of the skin becomes smoother and elastic. 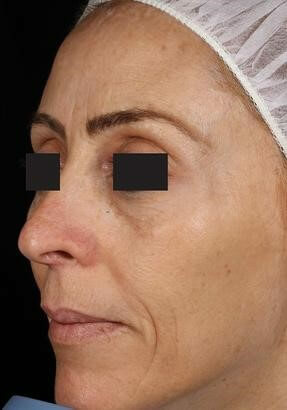 Ageless Aesthetics recommends at least 4-5 treatments, 4-6 weeks apart. The total number of required treatment sessions depends on the skin&apos;s condition. During the treatment, the patient may feel a warm, prickly sensation as energy enters the skin. A pink or red appearance is also common after treatment. Topical ointments and coolants are used to reduce unpleasant feelings during treatment. This is an awesome procedure, 3 lasers in one service. 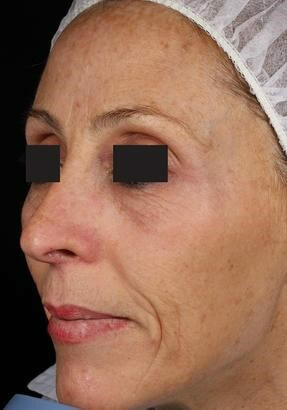 The IPL portion of this service is used to target and treat benign pigment (freckles, brown spots, age spots, etc.) and vascular lesions (small broken capillaries and red undertone of skin). This results in a clearer, more even toned complexion. The second portion of the service is skin tightening. Over time a loss of collagen and elastin in the dermis creates fine lines, wrinkles, and sagging skin. The refirm procedure uses a combination of infrared light and radio frequency to provide immediate contraction of existing collagen fibers. This contracting of collagen fibers over the next few months leads to improvement in sagging skin in the jowls, neck, and cheeks. The final portion of this session is the matrix RF which is very effective in helping to resurface the skin while also adding deep collagen stimulation through the matrix technology. Gradual and cumulative improvement of skin tone is typically achieved over 5 treatment sessions. The total number required treatment sessions depend on your skin&apos;s condition. We do apply a topical numbing agent to your skin and allow time for this to take effect. We also cool the skin surface ensures additional safety during treatment. This is a little to no downtime procedure. Most patients return to normal activities immediately after treatment.